The Ridgeway National Trail, 87 miles (139km) through ancient landscapes, over rolling, open downland to the west of the River Thames, and through secluded valleys and woods in The Chilterns to the east, following the same route used since prehistoric times. The Ridgeway, west of the River Thames, largely has Byway, Restricted Byway or Bridleway status – all of which are legal to ride on an MTB – and the best bit is that Swindon is pretty much in the middle! Please note that east of the River Thames much of The Ridgeway is a footpath which you must not use without landowners permission. Cyclists on The Ridgeway, east of White Horse Hill. Photo by and © Jos Joslin. 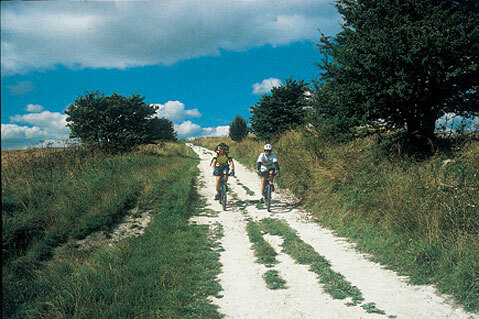 Coming off The Ridgeway, particularly in Wiltshire, is a whole network of other rights of way meaning you can ride for hours without hitting tarmac. The type of surface varies greatly from mud to chalk to compacted gravel and is generally ridable by all abilities. Good starting points are White Horse Hill or Barbury Castle car parks which although very popular with all Ridgeway users, after just a few minutes riding you will be past the crowds. For more information see the National Trails website here or view the entire route here. Also look at our routes page which details various rides on and around The Ridgeway or just grab an Ordnance Survey map and go exploring!